Mary Berry's Queen Cakes from her book Fast Cakes: Baking made easy-in minutes! My daughter's preschool is having a Jubilee Party tomorrow and the parents were asked to help supply the feast! Unfortunately Mini-Baker will be unable to attend. Long story, but I couldn't let the other kids down after I had signed up to bring fairy cakes. When recently flipping through my copy of Fast Cakes (my first ever baking book!) I came upon Queen Cakes. How perfect is that?? So, of course I made them. I realised though after I made them I had completely left out the baking powder so if you make them yours might rise a bit more then mine did! oops. Because of the self-rising flour they were completely fine. Still light and very good. For the preschool I did a basic icing and tinted it red and used the golden spray I had left over from these whoopie pies to make it a bit royal! :0) I kept the decorations simple as kids are just going to eat them up and not care what they look like! These really are fast cakes as it's about 10 minutes to prepare them and only 15 minutes in a preheated oven! 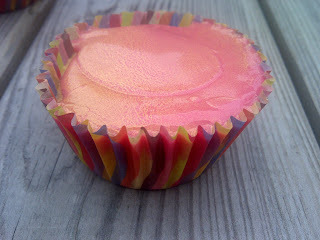 Also I would say they are perfect for making with kids and you can have your kids decorate them for the Jubilee! If you don't have kids these make a perfect treat for the Jubilee!! Enjoy!! Heat the oven to 400F/200C/gas 6. 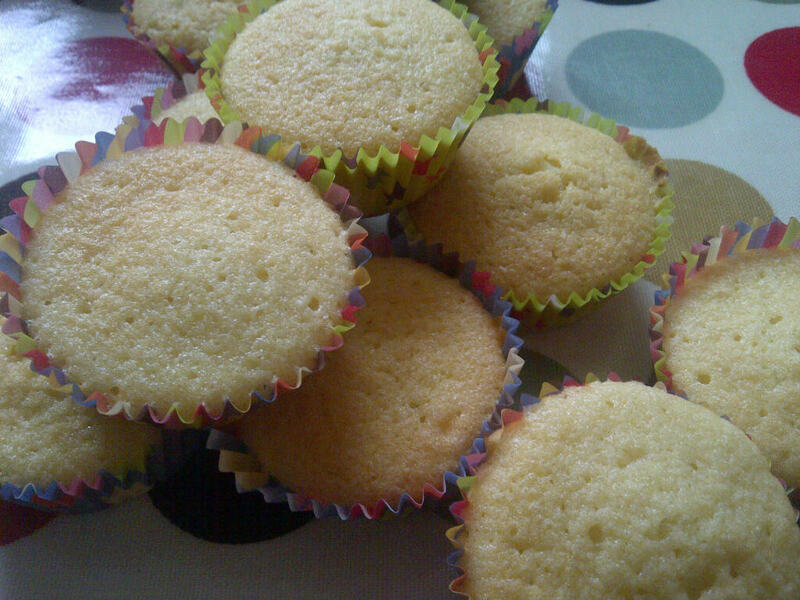 Have about 18 paper cases in the muffin/bun tin; the number of cases required will vary slightly if the cakes are to be iced or extra ingredients added. Put all the ingredients in a bowl and beat by hand for 2-3 minutes or for seconds with a hand held mixer or until well blended and smooth. Divide between the paper cases and bake in the oven for about 15 minutes until the cakes are well-risen and golden brown. Lift out and cool on a wire rack. There are a lot of variations you can use with this simple easy recipe. If you want to ice them put a little less batter in the case so it has a rim and it makes it easier to ice. 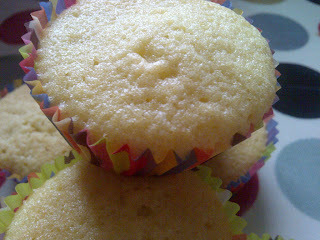 Make up 2-3oz (50-75g) icing sugar with a little water and flavoring. Pour it over the top of the cakes and decorate, as you like. 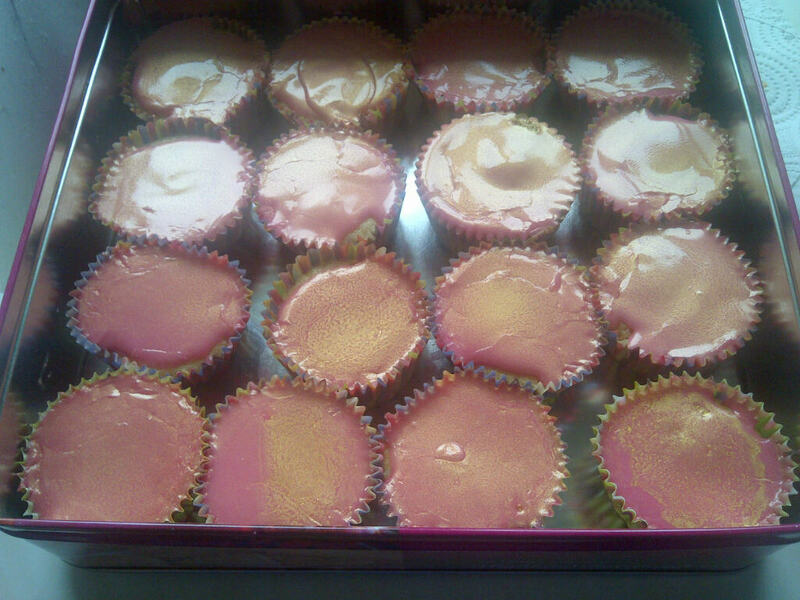 I tinted my with red food dye and sprayed with an edible gold spray. The official emblem for The Queen's Diamond Jubilee in 2012 is the winning design following a national competition for children aged between 6 and 14. It was drawn by 10-year-old Katherine Dewar, from Chester. Peggy Porschen's Chocolate Heaven Cupcakes! !